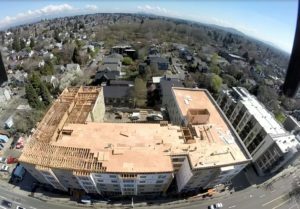 Beatrice Morrow Construction Update March 2018 - Portland Community Reinvestment Initiatives Inc.
Aerial view of the Beatrice Morrow building, March 2018. The Beatrice Morrow development reached a milestone in mid-March as construction of the top floor was completed and the building’s roof trusses and sheathing were installed. 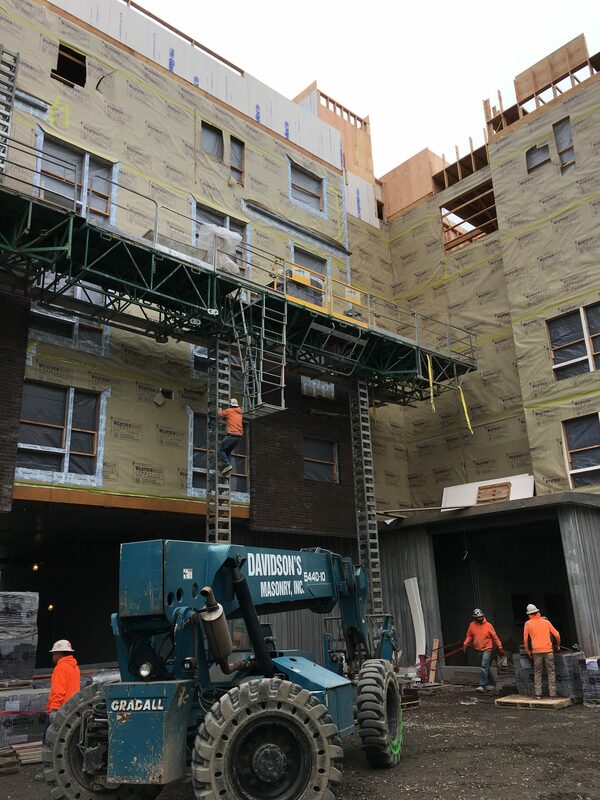 Installation of the brick exterior is beginning the building’s courtyard while installation of the plumbing, mechanical and electrical systems continue inside the building. As has been the case during throughout construction, street closures are to be expected during the day on Ivy Street at NE Martin Luther King Jr. Blvd., as well as parking spaces on NE Cook Street. Some intermittent closures of NE Cook Street and NE Martin Luther King Jr. Blvd. 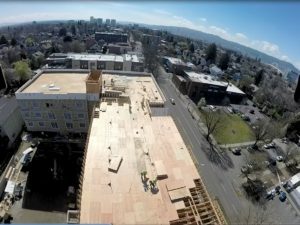 are also likely in the future as needed to facilitate jobsite access and safety, including safety requirements mandated by the Portland Bureau of Transportation. 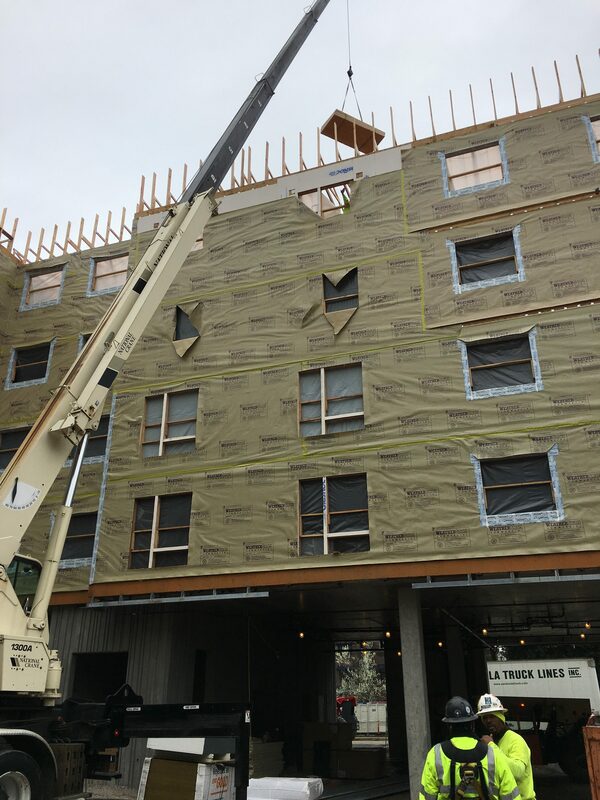 General contractor Colas Construction has been in communication with construction crews at an adjacent, unrelated construction project at 422 NE Ivy Street, and others to help ensure safe access on the street for large trucks and other special needs. In addition, the project team has had regular communication with City of Portland and Portland Bureau of Transportation officials to ensure we are in compliance with all construction, traffic and noise ordinances. Additional information and prior construction updates can be found HERE. Completion of the 80-unit mixed-use commercial and residential building is anticipated in mid-2018 and all apartments are expected to be leased by the end of 2018.